Co-operatives provide education and training for their members, elected representatives, managers, and employees so they can contribute effectively to the development of their co-operatives. They inform the general public – particularly young people and opinion leaders – about the nature and benefits of co-operation. - From the International Co-operative Alliance – www.ica.coop. A feature of international co-op complexes is an education and training platform for members that is shared and informed by member co-ops. Meant to augment individual member co-op’s training, the VAWC Owners’ Manual is given to all VAWC Member Co-ops and is a basis for the education, training, and empowerment of co-op members. The Owners’ Manual serves as a ‘one stop’ resource for co-op members to participate in their own co-op – from mission and vision to business plan and policy book – as well as how to operate their own support co-operative – from VAWC’s history and structure to staff responsibilities and marketing support. Co-op Certificate students presenting their co-op business plans. We are very proud of our work with faculty, administration and students in the Economics Department at UMass, Amherst. Along with the Neighboring Food Co-op Association (NFCA) we have co-created a Certificate in Co-operative Enterprise. Made up of curriculum focusing on the co-operative model and an internship with NFCA or VAWC co-ops the Certificate is a one-of-a-kind program for undergraduates to experience co-operation first hand. Through the CEC we are also engaged in support the Student Run Co-op Businesses and the Center for Student Business in support and expansion of their unique, educational business model. Check out the CEC on facebook. You can see some of the work being done by students for Collective Copies and Pedal People. Building Co-operative Power explores strategies from the Connecticut River Valley as a guide and inspiration for developing a regional co-operative economy based on a vibrant and engaged worker co-op sector. It speaks directly to obstacles and opportunities for making worker co-operatives an increasingly important part of the U.S. economy. The authors relay practical insights on co-op governance, communication, conflict and inter-cooperation. These are highlighted by cautionary tales and sagas of personal transformation. To learn more about VAWC and co-op led development we encourage you to read Erbin Crowell’s Masters Thesis on VAWC Exploring Co-op Led Development. 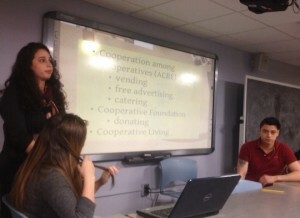 We Run This: Peer to Peer Internal and External Educational Mechanisms – Co-presentation with Neighboring Food Co-op Association at the Association of Co-operative Educators. Co-op Conversions for Business Success: Why Go Co-op? – from Northeast Organic Farming Association, co-presented with Neighboring Food Co-op Association. We hold workshops at several nearby and co-op movement conferences where you can come and learn about us and co-op led development. We’ve had the pleasure of presenting at the Eastern Conference for Workplace Democracy, United States Federation of Worker Co-operatives, Center for Popular Economics, Western Worker Co-op Conference, Western Mass Jobs With Justice, Northeast Organic Farming Association (NOFA), Advancing Development of Worker Co-ops, Slow Living Summit, and co-op board and member meetings and more. We also support events about co-ops and the co-operative model. We’ve had the pleasure of hosting or co-hosting Nobel Prize winners, Program Directors of co-operative education universities, co-operative delegations from Mexico, and board and staff from national co-op organizations. We’ve co-hosted numerous co-operative businesses openings, on air round tables on co-operation, speaking engagements from co-operative leaders, welcomed cross country bicycling co-op enthusiasts and more. For event information try facebook and twitter. VAWC is owned and operated by its members who direct the resources and staff to meet their shared goals. Like any co-operative having engaged, informed members is key to a thriving workplace and business meant to build an intergenerational asset rooting jobs and wealth in communities. We’re unique in being a support and development organization that is run and funded by co-ops themselves and education is a key to making what we do possible. The informed participation of our member co-operatives provide the resources for supporting several conversions to worker co-ops, our Working for a Co-op Economy marketing campaign and our VAWC Interco-operative Loan Fund.